Review - Future Imperfect #1 - The overthrow of Maestro begins.....or does it? Future Imperfect revisits the world of Maestro. 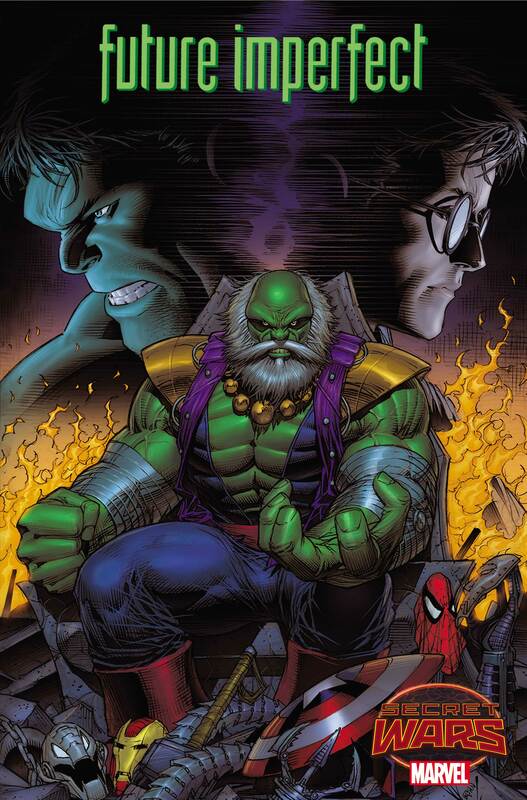 Maestro is a villainous version of the Hulk who has effectively killed off all of the other Super Heroes and rules the world with an Iron Fist. He is a mixture of 1984s Big Brother but with the power and strength of the Hulk. In Hulk form he has all of Banner's intellectual capacity and also a wide array of technology that enhance him. Making him into a terrible force by himself. He has a trophy room that includes the weapons and equipment of many of the dead heroes he has killed. There is a rebellion fomenting in Dystopia and one of this groups leaders is Ruby Summers. Ruby Summers is the daughter of Scott Summers (Cyclops) and Emma Frost (The White Queen). She has the ability of turning her self into hardened ruby and can fire black optic blasts from her eyes. Her optic blasts require her to wait 13 seconds before she can fire another one. Ruby has the ability to convert back and forth between flesh and ruby but the conversion to flesh would cause her to suffer the effects of aging all at once. At 70 years old she thus remains permanently in Ruby form. Both Maestra and Ruby are great characters that have not been shown much so this series is a great way to put them back in the spot light again. Ruby meets an old man in the wastes. He claims to be a weakened Odin and she bring him back to the lair of the rebellion. At the end of the books we are treated to a few surprises and a solid cliff hanger. I thought this was a good introduction into the world of Dystopia and Maestro. I also felt that Ruby and Maestro and their battle were introduced effectively. I liked the twists at the end as well. The story did not feel complete but that is to be expected with a #1 book. The Story takes place in the Battleworld realm known as Dystopia on the map it is listed as #2. This realm is a wasteland with only the major city of Dystopia having anything of substance. It is bordered by the the realm of Greenland and its armies of rampaging Hulks.